It's summer here in sunny South Africa, and everyone is spending more time in the great outdoors. The air is fresh, the sun is high, and nature beckons us to come closer. Whether it be at the beach, in public parks, or simply in your own backyard, outdoor time is an inevitable part of the summer regime for the majority of us. The last mentioned option is the most accessible to the most of us, however, as it doesn't necessitate any financial commitment or travel. If you do want to make your backyard more conducive to enjoyment though, there are several ways in which you can invest to make that happen. An unfailing option is the installation of a patio or terrace, which will provide you endless hours of relaxation and space for entertainment. Today, we will look at how you can easily make this happen for your own backyard, by reviewing such an example completed by the talented floorers at PHU Bortnowski. 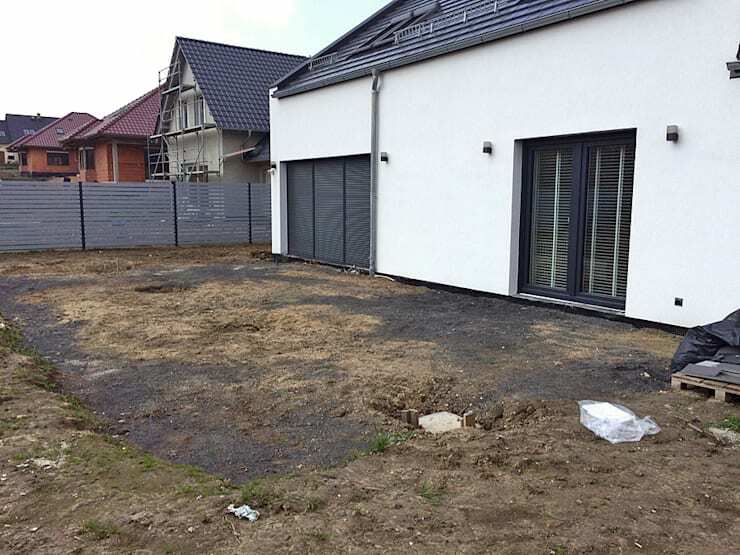 In this image we can see the space which is to be the spot for the brand new terrace on this property. This desolate and deteriorated patch of land sure doesn't look at all like much at the moment, but we can see the potential of the area. The dimensions are quite large, allowing for ample space in which to build a patio space, and this will definitely beautify the existing backyard space. When you have a limited budget and the garden looks as barren as this, a terrace may just be the perfect solution for you space. 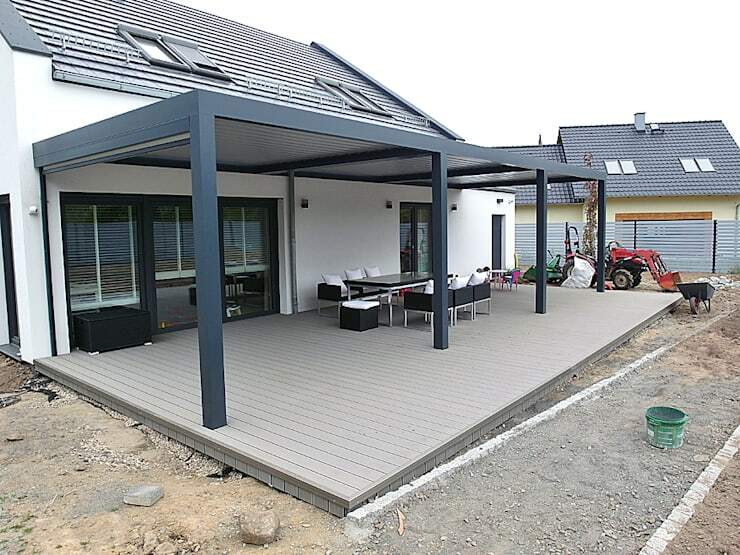 Here we can also see another element of this terrace in the making—the canopy or roof that covers the deck area. This canopy stretches out about two thirds across the terrace and consists of corrugated iron on a metal framework. The length of the canopy allows for the majority of the deck to be covered and sheltered from sun or rain, while a portion in left open for those who enjoy sunbathing. It is important to note at this point that all the materials used for this terrace are low-cost, showing us once again that you do not have to break the bank in order to get an impressive and functional entertainment feature for your home. 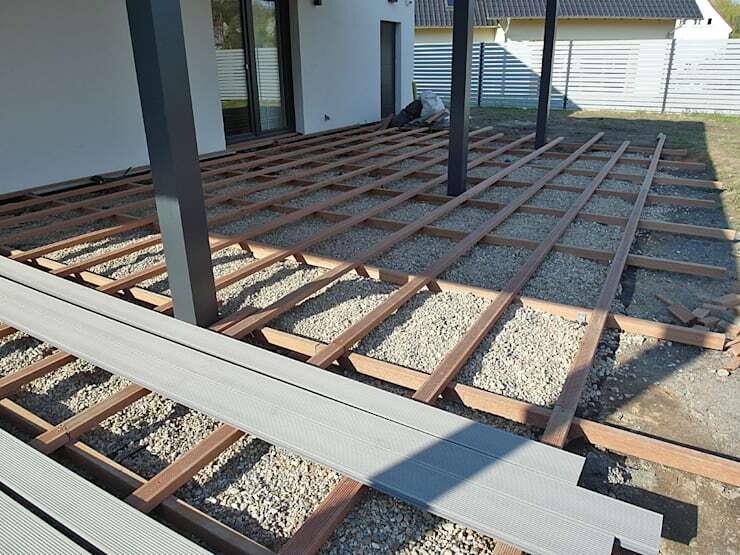 Even the decking, which we can see they have started to lay down on the far end of the terrace, is a light material that is weather- and wear proof. In this next image, we can see how the groundwork had been done for the building of the terrace. We can see that the professionals started preparing the ground after they had measured the area which would be taken up by the new feature. 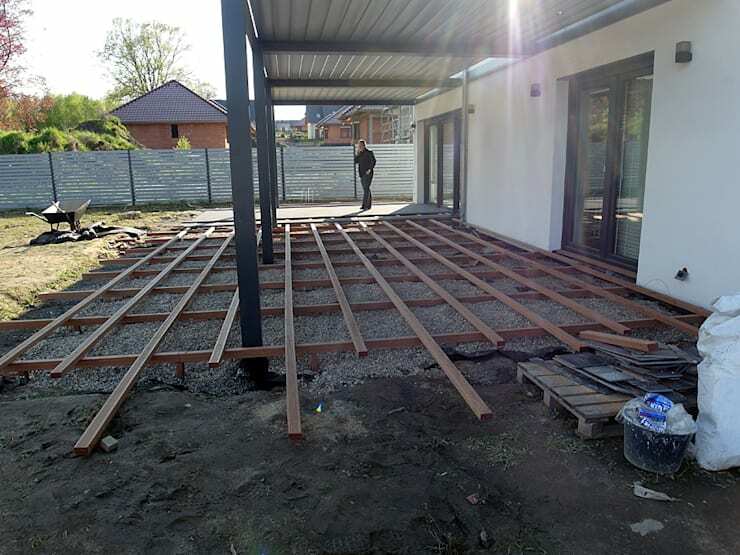 Firstly, the area was covered with gravel, in order to secure the wooden framework for the deck, as well as to ensure proper drainage below the terrace. Next, we can see a lattice framework of timber place across the area as to provide the foundation for the terrace. These planks had been equally spaces in order to ensure a sturdy and reliable foundation. The result of this process is a beautiful and modern terrace that any home would be enhanced by! The clean and minimalistic style of the feature makes it relevant to contemporary design, and gives it a sense of timelessness that can be enhanced by decoration or patio furniture as the inhabitant's tastes dictate during any given time period. Whether you bring on board a set of professionals or decide to go DIY, this project shows that a stylish terrace can easily be achieved by us all. Now if you're looking to take the outdoor entertainment idea a level higher, take a look at how you can create a fabulous rooftop space as well! Do you think your backyard can benefit from a multipurpose terrace such as this one?